Howdy "Silver Age Sunday" and other fans. If you've been by in the past week or so, you've noticed a new look and title for the former "Atom: The Mighty Mite" blog. As you may recall, this blog was created as a stand in for Damian Maffei's The Tiny Titan to take part in the yet unfinished Crisis On Earth-Blog: The DC Challenge multi-blog crossover last January. I rather faithfully reconstructed (with Damian's consent) the old site, down to the layout and out of date links. I'd also tried to write in Damian's style, which I never achieved, but it did help break me out of the more cool, dry voice I'd developed for my Martian Manhunter blog. The similarity between the two blogs caused a bit of confusion, and has inhibited me from trying new things here, so I decided it was finally time to make this place my own companion/continuation rather than a botched clone. The new banner isn't the easiest to read, isn't as cool as Damian's, and has some rough "lettering" by yours truly, but it'll keep for a while. Some folks really dig it, and I don't have time to start over or apply major tweaks. The actual "ATOM" logo was an unused Rian Hughes piece that evolved into the one sported on The All-New Atom series starring Ryan Choi. I dig that retro vibe, and wanted something that would be easily distinguishable from the classic logo Damian employed. 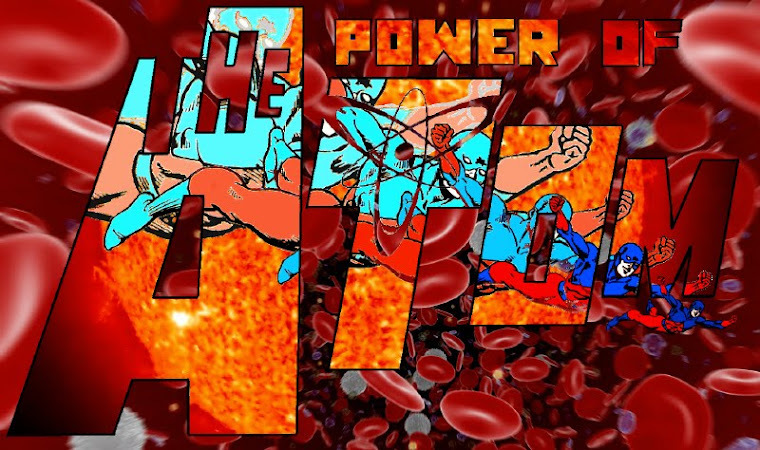 The new blog name came from the 1980s Power of the Atom series, which had a logo font even creator Todd Klein finds boring today, which is why I went a different way. It might come into use at a later date, though. I hope folks like the new layout and colors. I experimented with colored backgrounds and text, but when you're playing with reds and blues, it can get to be quite a pain in the eyes. I also like a certain uniformity between my super-hero blogs, including the sidebar links, 400 px wide standard images, and so forth found at the Manhunter and Justice League Detroit blogs. Suggestions and criticisms are welcomed. As for "Silver Age Sunday," well, that's going to see some changes, I'm afraid. I want to sync up coverage between my three main hero blogs, and since the Atom's series doesn't tie into the Manhuhunter's Justice League of America coverage until fourteen issues in, I've got some serious catching up to do on that blog. In the meantime, I'll still offer roughly bi-weekly write-ups of the Atom series up until #4 (where everything would sync up,) aided by the book's bifurcated format (usually two stories per issue.) 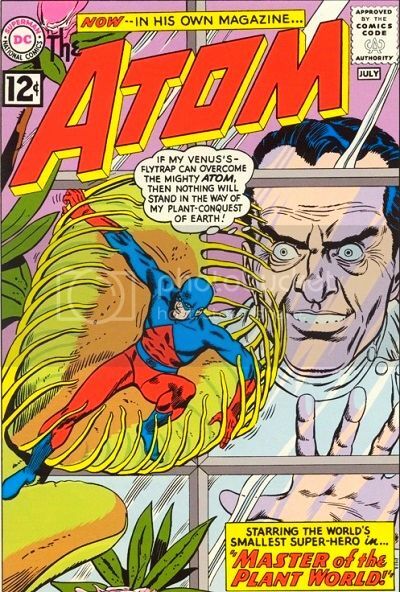 I'll also be bringing back Bronze Age coverage with the Sword of the Atom series, as well as more varied posting subjects to launch this May. First off, some modifications to this column. I'll try to offer up random links along with solicitations, as well as extended commentary on each product. For instance, we no longer have to worry about the future of Ray Palmer. He's getting a one-shot special in July, followed by become the co-feature in Adventure Comics. Meanwhile, Ryan Choi fans should start sweating bullets. 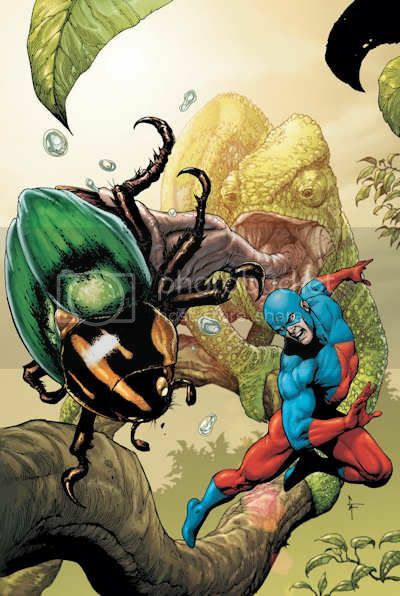 The Atom's new writer speaks out in the CBR interview Lemire Embiggens Ray Palmer. The gist of it is no more bellyaching about Jean or anything else, and just getting down to Silver Age revivalist adventuring. Jeff Lemire seems very fond of the early stories, and is backing away from the right-wing hardliner of recent years. The creators of "Brightest Day" also had things to say. Several fans asked after the status of the "new" Firestorm and Atom now that Ronnie Raymond and Ray Palmer had come back. 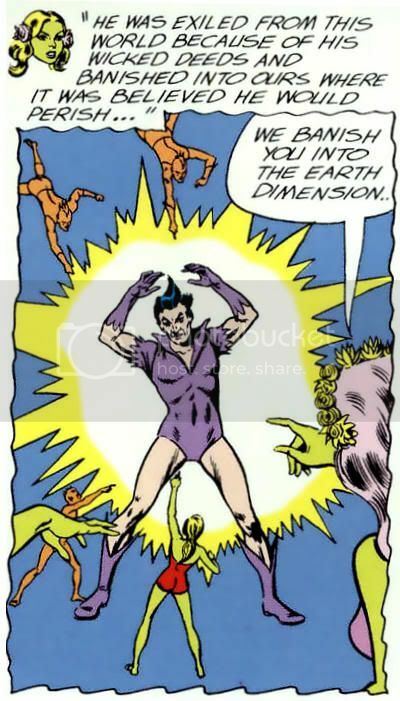 The panel played coy on the issue of the Atoms and how many there would be, though Johns noted that in terms of "Brightest Day," "Jason and Ronnie don't like each other." Discover all-new allies, enemies and adventure as The Atom leaps from the pages of BRIGHTEST DAY into this one-shot special! Rising stars Jeff Lemire (SWEET TOOTH) and Mahmud Asrar (Avengers: The Initiative) update the Atom’s origin and kick off the tiny titan’s next major story, which continues this month in ADVENTURE COMICS #516 (see page 87). If you thought you knew Ray Palmer, then think again! The smallest hero in the DCU is about to become one of its biggest, and the excitement starts right here! Intriguing writer, a really swell artist who has done good by "Dynamo 5," and the launching pad for Ray Palmer's future. Why wouldn't you buy this? ADVENTURE COMICS returns to its historical numbering with this issue just in time for Paul Levitz to retell the Legion’s origins! Everything begins on a somber note reflecting on the past with “The Last Will and Testament of R.J. Brande”! Also, this issue begins an all-new co-feature starring The Atom, which continues the story begun in this month’s BRIGHTEST DAY: THE ATOM SPECIAL #1 as Jeff Lemire (SWEET TOOTH) launches Ray Palmer into an exciting new adventure smack-dab in the middle of the DCU. According to Lemire, this will be the first of ten 10-page chapters. I dug Levitz's Legion from back in the day, but after Shooter was given the bum's rush following an under appreciated run, I was going to give this a pass. 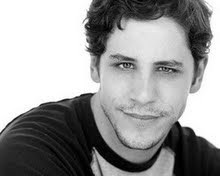 With the Atom, I've changed my mind, though you may prefer to wait for the inevitable 122 page trade in 2011. By the way, Kevin Sharpe is a solid artist in the 80s mode. I'm still listing this, but be warned, Lemire says the Atom won't actually be getting much play in this series. As far as I know, Ray Palmer is still in the Justice League at this point, though Robinson says he'll have had some characters taken against his will from his line-up by this point. The BRIGHTEST DAY continues with Part 3 of the JLA/JSA crossover! Jade is back! But is her return a blessing or a curse? The powerful Starheart empowering Green Lantern Alan Scott is out of control and unleashing its chaotic energy across Earth. What has lured the Starheart here and what familiar threat must the World’s Greatest Heroes and the Justice Society of America team up to stop? The evolution of the DC Universe continues as the Silver Age of Super Heroes dawns with the appearance of Superman, Batman, Wonder Woman and dozens more in the wake of the disappearance of the Golden Age heroes from active duty. Simultaneously, heroic humans without powers hold up their end of Earth’s defense as the Challengers of the Unknown and the Sea Devils emerge to lend a hand! Al Pratt had his turn, and Ray's likely ascendant here. The hugely successful BLACKEST NIGHT action figure line continues! Included in this eighth installment of the series are: Black Lantern Black Flash, Professor Zoom’s reanimated corpse, holds curious sway over The Flash’s other undead rogues; Orange Lantern Lex Luthor, the new Orange Power Ring seeks out Lex Luthor for his avarice and lust for power; Indigo Tribe The Atom, with compassion and sense of duty stronger than ever, Ray Palmer serves as the binding force uniting the spectrum of power; Sinestro Corps Member Scarecrow, delights in instilling fear in others and is rewarded with the Yellow Ring of Power. 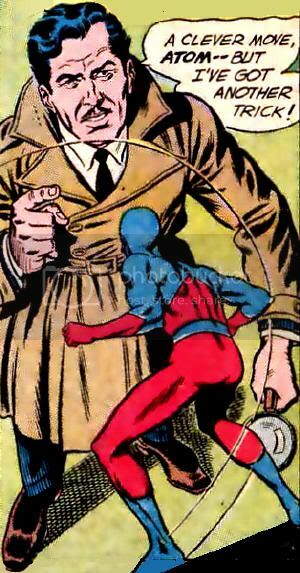 I'm unwilling to shell out good money for the action figure representation of a variation on the Atom that lasted for a handful of comics, but I wouldn't hold your breath for a "Sword of" toy. This might be your best bet along those lines, and well executed besides. Whether or not the Atom is still a member, he definitely appears here in reprint form! The Tiny Titan is on the preview art of the pop-up book, and hopefully will turn up in both, though likely really small. I recognize there's was a lot of love for Denny O'Neil in the '70s for restoring Batman to "Dark Knight Detective" status and for coming up with Green Lantern/Green Arrow. An alternative view (mine) is that O'Neil was technically a terrible writer. 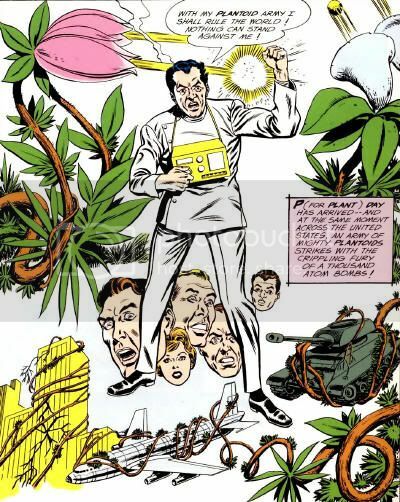 I'd say he exemplified the growing pains between the Silver Age "middle aged white guys writing adventure stories for children" and the Bronze Age "twentysomething white guys writing adventure stories for man-children." Read today, O'Neil's scripts are cringe-inducing in their hoary dialogue, sensationalism and self-importance. In my opinion, it wasn't until O'Neil stopped drinking and embraced the hubris in himself and his characters that he finally earned his stature in the industry. 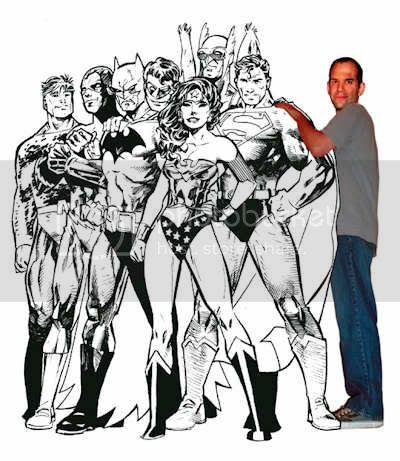 In a roundabout way, my point is that Judd Winick was the Denny O'Neil of the aughts, and maybe he should start drinking/drugging to improve his writing, before he drives his remaining audience to do so. Certainly, this news announcement has me wanting to call in sick to work and crawl into a bottle. Check it out.